Handmade is perhaps a misnomer for many craftspeople, who rely as much on their hard-working hands as on the beautiful and complex machines they touch. That said, the work is no less challenging for this reliance. On the contrary: the care and expertise that go into working well with a machine only add to the skilled labor of the craftsperson. And in the hands of an artist, a well-kept machine brings remarkable things to life. Here now, two stories of makers and their machines. Canadian knitwear designer Anna Zygowski produces an impressive array of goods on five old-fashioned knitting machines in her Hamilton basement studio. Inspired by vintage patterns and photographs, it is any wonder she feels just as passionately about revamped classic machines? The daughter of a clockmaker, she even enjoys restoring the machines herself—but prefers analog machines to the newer computerized versions. In a recent blog post, she showcased two of her vintage machines, both mid-century Italian models. The Dubied hand-flat knitting machine and Santagostino are industrial models with complex working parts and hard-to-track-down user’s manuals. Dismayed at the dearth of technical information available for high-quality knitwear production, Zygowski shares the fruits of her research, and her expertise, with the online community. There’s palpable enthusiasm in her blog posts, and a genuine desire to preserve this knowledge for the future. We’re glad she’s a collector and a maker, and we love the gorgeous Anna Kari mitts and scarves now gracing Bespoke’s shelves. Take a gander here, then come check them out for yourself. West of Ontario in Faribault, Minnesota, another textile business is just as keen on restoring, preserving, and building on the sound traditional tools of the past. Family-owned Faribault Woolen Mills has been operational since 1865, but the mill recently underwent an extensive revitalization, with a new generation of family owners stepping in to revive the sleeping machines. Originally horse-powered, the mill is practically woven into American history, having its beginning in the turmoil of the Civil War and keeping troops warm through World War II. 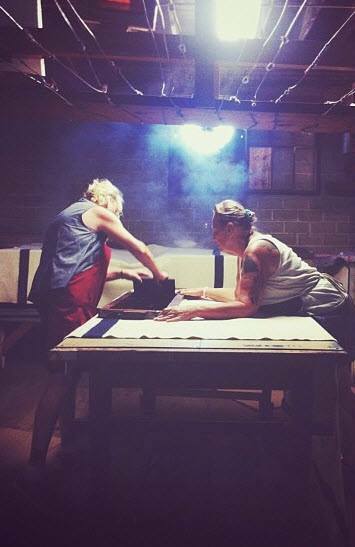 A fifth generation of craftspeople is now hard at work bringing lush wool blankets to a fast-paced world still eager for the fruits of simpler times. Watch two great films by the Faribault team, showcasing the Mill's transformation and its ethos.